Dangal (English: Wrestling competition) is a 2016 Indian Hindi-language biographical sports drama film directed by Nitesh Tiwari. 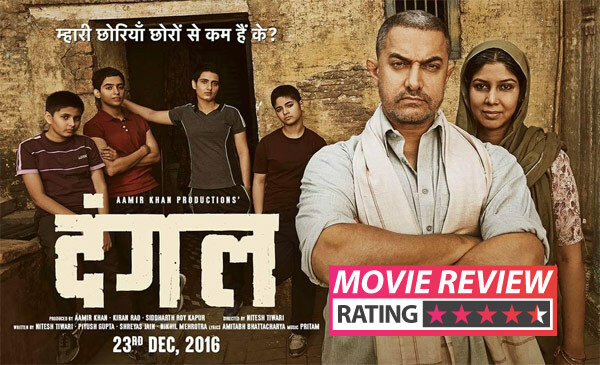 It stars Aamir Khan as Mahavir Singh Phogat, who taught wrestling to his daughters Geeta Phogat and Babita Kumari. The former is India's first female wrestler to win at the 2010 Commonwealth Games, where she won the gold medal (55 kg). Her sister Babita Kumari won the silver (51 kg). "Dangal" is the Hindi term for "a wrestling competition". Pink is a 2016 Indian courtroom drama film directed by Aniruddha Roy Chowdhury, written by Ritesh Shah, and produced by Rashmi Sharma, Sheel Kumar and Shoojit Sircar. It stars Amitabh Bachchan, Taapsee Pannu, Kirti Kulhari, Angad Bedi, Andrea Tariang, Piyush Mishra, and Dhritiman Chatterjee. It was released on 16 September 2016.The Central Board of Film Certification (CBFC) granted the film a U/A certificate with four verbal cuts. The film was appreciated by both the audience and the critics. The film was specially screened for the Rajasthan Police so as to train them to be sensitive and sensible about women's rights and dignity. The film was also invited for a special screening at the United Nations headquarters in New York City. On 4 November 2016 the movie completed a successful 50 day run at the movie theatres. The plot centers on the Libyan-backed Abu Nidal Organization's hijacking of Pan Am Flight 73 in Karachi, Pakistan, on 5 September 1986. The film is shown from the point of view of the flight's head purser, Neerja Bhanot, who thwarted the hijack attempt by alerting the pilots, thus grounding the plane; Bhanot gave her life to help save 359 of the 379 passengers and crew on board. Development began in September 2014, when Kasbekar signed Madhvani and Kapoor for a film to be made by Bling Unplugged and Fox Star Studios. Saiwyn Quadras and Sanyuktha Chawla worked on the script, with principal photography taking place in Mumbai. The film features music by Vishal Khurana, with lyrics written by Prasoon Joshi. Neerja was released on 19 February 2016 to positive critical reception, with praise directed to Kapoor's performance, and became one of the highest-grossing Bollywood films featuring a female protagonist. Sonam Kapoor's performance was critically acclaimed. The film holds a rating of 7.9/10 in IMDb. Udta Punjab (English: "Rising Punjab") is a 2016 Indian crime-drama film co-written and directed by Abhishek Chaubey. It is based on drug abuse in the Indian state of Punjab. Produced by Shobha Kapoor and Ekta Kapoor under their banner Balaji Motion Pictures, in association with Anurag Kashyap's production house Phantom Films, it features Shahid Kapoor, Kareena Kapoor, Alia Bhatt and, Diljit Dosanjh in lead roles. On 4 June 2016, the Central Board of Film Certification sought a stay on the film's release citing that the themes dealt with in the film were too vulgar for the general audience. As a result, the producers were directed to make a total of 89 cuts in the film. However, on 13 June 2016, the Bombay High Court struck down the stay and gave permission for the film's national release, albeit with a single cut in the screenplay. The film was released worldwide on 17 June 2016. With a budget of ₹300 million (US$4.5 million), the film premiered worldwide on 22 January 2016. The marketing of the film played an important role in the film's promotion and collaborated with the flight company Air India, who had a major contribution in the evacuation of record-breaking number of Indians during the war. The film is featured among the 2016 Indian Panorama section of the International Film Festival of India. As the rating and critics review , these films stands on top 5 for the year 2016...and here follows the other movies in the top list of 2016.